....crazy on the crazy golf. What a lovely happy photo. They look a really nice group of young ones having a fun time. Students maybe? Good photo. Vb they were indeed a nice group of young people who were actually employees of AO.com, hence the caption. 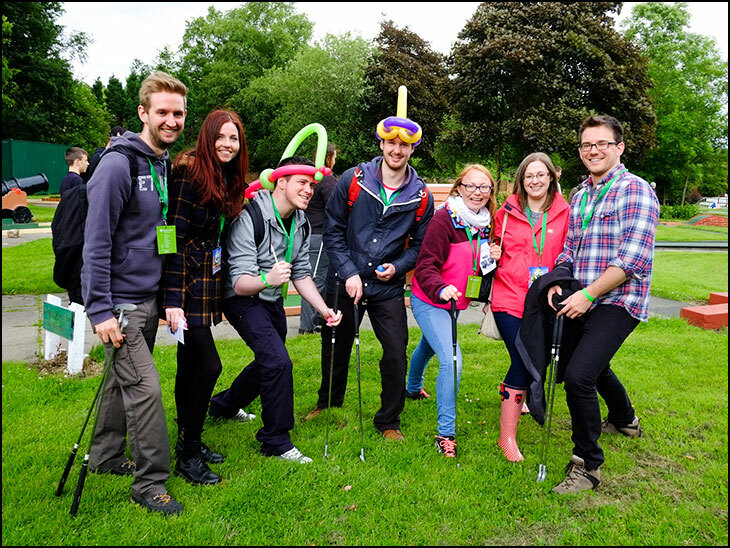 They had attended the company's "Summer Event" (works do) in the Walled Gardens, at Haigh, and when they were leaving saw the crazy golf and enjoyed a round before going home. Much as I like the scenery photos on here, it is nice to have a "people" photo now and again. After reading of the recent disgusting acts of destruction at local cemeteries by youths, this photo goes a long way in proving that we only read about the bad side of youth.....this group of friends have brightened my day, and I hope they had a wonderful time. Hmmm..... I'm afraid I have serious concerns regarding the headwear worn by the chap in the centre of the frame. But maybe it's all down to the camera angle.